"From Freedom Rides to Ferguson" gives Coursera participants an opportunity to learn from activist Bernard LaFayette Jr. in the context of locations important to the Civil Rights Movement. Here, LaFayette (left) talks with fellow activist Rev. C.T. 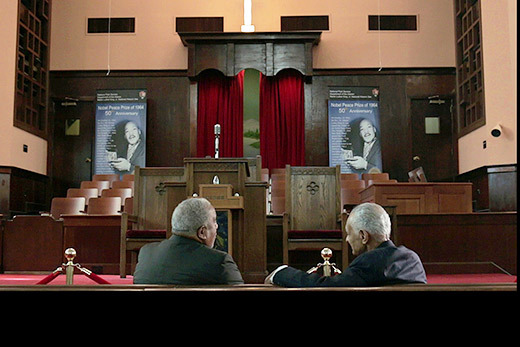 Vivian at the historic Ebenezer Baptist Church while filming for the course. Photo via Emory Libraries and Information Technology. When Emory neuropharmacology professor Michael Kuhar first created a MOOC (massive open online course) based on the impact of addiction on the brain, he never imagined it reaching an international campus of hundreds of thousands of students. But over the past five years, “The Addicted Brain” has done just that, as one of more than a dozen courses now available to online learners through a partnership between Emory and Coursera, an online course provider that serves learners across the globe. To date, the partnership been a creative and successful endeavor, educating students around the world while showcasing the expertise of Emory faculty and demonstrating, in a tangible way, the university’s commitment to helping humanity. “Since the course launched in 2013, over 300,000 people worldwide entered the website and examined the course, and over 65,000 learners have taken all or part of it,” Kuhar told a recent gathering of faculty at “What We’ve Learned from Teaching MOOCS,” a workshop hosted by Emory’s Center for Faculty Development and Excellence. “Reaching that many people is something I never dreamed would be feasible,” acknowledged Kuhar, Candler Professor of Neuropharmacology at the Emory School of Medicine, a researcher with Yerkes National Primate Research Center and a senior fellow in the Emory Center for Ethics, who has taught at Emory for 23 years. And the free, online teaching platform, which he once worried might feel stagnant, has actually proven “much more interactive and dynamic than I ever imagined,” he said. Coursera was launched in 2012 with a vision of bringing free education to the masses. Today, the company partners with some 164 universities, museums and institutions across 28 countries to produce more than 2,700 courses. Coursera typically provides the platform and the technical support; institutions offer the teaching talent and scholarship. To date, that model has largely remained intact. Online learners may still elect to audit any number of Coursera classes at no charge or pay a fee of around $49 per course to receive a certification of completion, as opposed to formal academic credits. But even as some other MOOC providers are beginning to focus on workplace-driven certifications and stream-of-revenue corporate customers, Emory has insisted on exercising its own distinctive strategy with online learning, says Pamela Scully, associate vice provost for faculty affairs and incoming vice provost for undergraduate education. For Emory, that has meant offering a mixture of courses with the capacity for social engagement and impact, says Scully, who has co-taught a Coursera class on “Understanding Violence” and oversees the Coursera initiative through the Office of the Provost. Course development is led by the Center for Faculty Development and Excellence (CFDE) in collaboration with the Library and Information Services’ (LITS) Teaching and Learning Technologies production team. Faculty developing Coursera courses are given the opportunity to collaborate with Emory experts on online teaching, instructional design and video production. From exploring the modern American civil rights movement in “From Freedom Rides to Ferguson,” taught by longtime civil rights activist the Rev. Bernard Lafayette Jr., to a course on the evolving Ebola epidemic and the launch of “Health in Complex Humanitarian Emergencies,” which starts May 7, the growing Emory catalogue of Coursera classes is “supporting our mission as a university,” says Scully. “We’ve really been strategic about focusing on what we can bring distinctively to the Coursera experience,” she adds. For example, when Oxford College psychology professor Ken Carter was preparing to publish a new book on the psychology of thrill seekers, Emory staff in the CFDE and the LITS production team in Woodruff Library were able to help him to create a companion course through Coursera, which also debuts May 7. Numbers show that strategy is working. Since Emory first launched Coursera classes, some 487,000 students have been drawn to the university’s courses, with an active enrollment of around 258,000. And enrollments keep climbing, notes Scully. Beyond educating students, Coursera is also impacting the lives of Emory educators. “We’re creating transformative teaching experiences for our faculty, who report a variety of benefits, from changing how they view assignment structure, increasing their books and publishing networks to what they get from sharing their expertise with a large audience and getting a different kind of feedback,” says Stephanie Parisi, CFDE assistant director of online education. Faculty interviews have revealed that visibility through Coursera teaching has led to invitations to be a part of new publications and collaborations, new connections to faculty and campus resources, and even increased book sales, Parisi reports. Last year, Ellen Ott Marshall offered a version of a conflict skills course she teaches at Candler School of Theology to Emory faculty through the CFDE. The course so was successful, CFDE asked Marshall to develop “Conflict Transformation” for Coursera. Employing discussion prompts, personal examples and peer-reviewed assignments, she’s been pleased at how the course has translated to the new format. One difference: For her Coursera course, student examples of conflict can arrive from Nigeria, Sudan, Lebanon, Israel and Palestine — unique and rich perspectives. “It’s remarkable to see how people are receiving what you put out there,” says Marshall, associate professor of Christian ethics and conflict transformation. “I work with doctoral students in the Graduate Division of Religion at Laney Graduate School and have realized that teaching effectively and thoughtfully through these technologies needs to be one of their skills,” Marshall adds. And over time, Coursera courses can be edited and shaped, keeping material fresh. After her course on violence was already online, Scully learned former U.S. President Jimmy Carter, University Distinguished Professor at Emory, was available to add an interview to the curriculum. She jumped at the chance. Now, a portion of the course features Carter discussing his work to end violence and in support of women’s rights. Those interested in learning more about the Coursera experience or about MOOCs as public scholarship are encouraged to contact the CFDE at 404-727-5269 or Parisi at stephanie.parisi@emory.edu.